For financial success there are certain things you must learn to do. But to do anything we need to act, and that action grows out of our attitudes, our motivation, our drive. Our attitudes or habitual ways of thinking about money can make the difference in success or failure with money and with life in general. Fortunately, our attitudes are subject to change even though many people are not aware of it. But we can in fact change our lives by changing our attitudes. Each of these articles explains one way to do it. Attitudes are habits of thought. Affirmations are one of the best tools to help us change the attitudes that shape our financial destiny. Here is an excellent place to begin our mental money makeover. Along with affirmations, visualization stands as one of the top two tools for changing attitudes. If you have never learned to make use of this powerful method for shaping your thinking about money, and other important aspects of your life as well, here is an introduction to the basics. Here is a little known secret about the way most people think about money which keeps them from ever having much. It may surprise you. By changing the way you think about this you may put your financial success into high gear. After—and only after—you get in control of your money, a small change in spending habits can turn your life around. As simple as it sounds, by spending a few dollars a month less (so that you spend a little less than you earn rather than the other way around) is all it takes. This attitude modification step can help make it possible. Yes, one of the best ways to accelerate our financial progress is to reduce our spending. Here is a suggested action step that will enable us to reduce ongoing expenses more than we might think possible. How many people who are in debt would not rather be out of debt? Unfortunately, very few people realize that it is largely the way they think about debt that attracts debt into their lives. Change the way you think about this and you will soon find yourself without any. One of the controling limits on most people’s income is self-imposed. Without even knowing about it people set a ceiling on their income. Understand this limitation and eliminate it with this step to make it possible for your income to soar. Many of our attitudes directly affect our income. Learn how to use basic affirmations to produce dramatic changes in your thinking relative to income. When we begin to think differently in this area our income will increase almost automatically. Believe it or not, you can be too serious about your money. Most successful people have learned to look at success as a game and money as a measuring stick. Use this technique to help you develop this attitude for yourself and achieve more. But I Want It Now! Instant Gratification or Delayed Gratification? People are beginning to recognize that choosing instant gratification over a long term plan for success has made a negative impact on their lives. Here are some suggestions to help you start thinking positively and productively in this area. Do you think of yourself as poor? Or, do you think of yourself as wealthy? Reality has little to do with our thinking in this area. Here are some suggestions for developing a healthy, and success producing, attitude about wealth. Why do you not earn more income than you do? The answer may surprise you. You may be able to earn more than you think, if you know this and do something about it. Whether or not you save money is determined more by your attitude about saving than it is by your income. Applying this action step can shape your attitude in a manner that will help you establish the savings attitude and habit. One of the most powerful tools in developing a success with money attitude is adopting the “You, Inc.” outlook. Here is one way to instill it into your thinking. It is one thing to have long term financial goals—and very important to have them—but it is another to keep ourselves focused on them. This visual tool can help us achieve that focus. You probably have heard of the “80-20 Rule.” This visualization step can help you implant the idea into your head so that it can produce meaningful results. Few people ever plan to be wealthy—or even seriously think about what it means to be wealthy. Here is how to start thinking about it in a way that produces results and focuses your mind on bringing it to pass. The Value of Your Time: How Much Is Your Time Worth? Here is an unusual idea for developing an attitude toward various work activities that will help you identify and focus on those which are most important. Some things just have to get done whether we really want to do them or not. Use this action step to make it easier, quicker, and less stressful for you to get these projects out of the way. It is one thing to start a task and another to finish it. This article explores how you can develop the persistence to follow through on all your work, but especially your financial tasks. The psychology of money concerns your thinking, your attitudes about money. 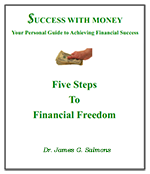 Nothing affects your financial success more than your money attitudes. If you have worked through these articles you should be well on your way toward changing your thinking for the better. Your money attitudes shape your potential for success. Many sections on this site share information related to this reality. In these articles, specifically designed as action steps for attitude modification, you will learn how you can actually change your attitudes (your thinking about money) to make you more successful with money.